The images coming back so far from Pluto look incredible. For the first time since Voyager uncovered exactly how exotic the moons of Jupiter really were — we are seeing things at Pluto that few saw coming. Some images show Pluto looking like a real-life version of a sci-fi illustration from the 1960s, with all kinds of lines, circles and spots of which we still know very little about. Shown above is the Chop Shop Studio poster celebrating New Horizons at Pluto and is being updated almost every day when new images are released from the mission. This is the third update from July 11 data. The design along with two other missions is being crowd-funded on Kickstarter right now and you can still vote on which missions make the cut for posters #8 and #9. A new imager turning out some impressive work on the Rosetta mission has popped up on flickr. These are not only gorgeous, but are the first color images I have seen of the comet thus far. Check out 2di7 & titanio44’s image feed and see not only more color images of the comet Churyumov-Gerasimenko, but also great work done at Mars and Saturn as well. Image Notes: The original of the first image above can be seen here. What is posted here was cleaned up a bit by wanderingspace.net and is not intended for scientific use. We did the best to represent what is in the original, but telling the difference between what might have been boulders and what was image noise is hard to determine. Also, the jets were reprocessed and altered to appear smooth in this final version. More on the color below. Image Notes: According to the imagers, there have been no filtered images released as of this date of Comet 67P/CG. Which means that the color above is artistic interpretation. Strikingly real looking, but still just a make-shift approach to consider what the color might be before any real data on color has been released by ESA. Discover online has an article today about some of the best in amateur space imaging. Many of which have been featured here on Wanderingspace before like Gordan Ugarkovic, Emily Lakdawalla and Bjorn Jonsson to name a few. The last item from Bill Dunford of Riding With Robots is an image that he actually suggested NASA point their HiRise cameras at that location. He suspected they might find something interesting there and they did —flash water movement and evidence of avalanches. One of the best images to ever grace this blog has to be Don P. Mitchell’s re-renderings of Venera 13 and 14. A miraculous re-rendering of Soviet-era data to create a whole new “human eyes” look at the surface of Venus (I also took the liberty of (artistically) colorizing those images as well). Now Ted Stryk — no stranger to these pages — has taken a shot at Venera 9 and 10 as well. The results are not as amazing as Don’s earlier work but that is simply due the missions having a more limited set of data. I must add that it is pleasing to see Ted’s (a scientist) colorizing is similar to our own (not a scientist). See the whole story of how Ted’s images were made here. The above is an interesting project to image the full Neptune system based on actual data returned by Voyager. According to the article published along with the image — Rolf Wahl Olsen composed this scene from actual images from the departing Voyager probe. The rings (which were never photographed in their entirety) are based on over-exposed images and then density mapped to a model which was applied to the scene. Even the stars are based on one of the over exposed images of the rings which revealed what the probe would have seen and that field data was inserted from and image generated by Google Sky. We have posted many images and preview clips for outsideinthemovie before. Here is another look at some preview stills from an opening scene to be unveiled at an event on Sept 17th in Austin, TX. Steven Van Vuuren — the film’s creator — tells us these images begin a pan out from Earth to the surface of the moon which culminates in a trip through the Solar System on the way out to Saturn. For those who may not recall, the film’s focus is on the Cassini Mission at Saturn and uses only real flat image photography returned from robotic spacecraft in a new technique developed by Van Vuuren that feels 3 dimensional. No renders will be employed and is therefore — a more realistic trip through interplanetary space than anything we have seen before. This composite has been kicked around a bunch on unmannedspaceflight.com. Contained within it are two separate images taken by the Cassini mission at nearly the same time but different exposures. Looking at this scene with human eyes, the big difference would likely be that the geysers would not be blown out and would look more like a multiple of gentle hazes spewing upward. The other big difference would be that you were somehow on a mission to Saturn and not browsing the web. Above are the two original exposures. These were merely combined with a photo editing tool. The geyser haze was blurred in areas to clean out compression artifacts and the color was artistically added by Gordan Ugarkovic. While the color is artificially generated, it does accurately reflect the same overall appearance of most natural light images of Titan. If you haven’t followed the work of Stephen v2 and his film “Outside In”, you might want to take a look at what he has in store for us. Using only still images from the Cassini mission, Stephen is making a very impressive tour of the Saturn system without using any CGI, 3D models or textures. While those techniques make great Hollywood films they often fall short of making something that is actually a real place… look real. See below for a very brief clip of how this all ends up looking with a much better and longer clip coming in the near future. from New "Outside In" clip teaser from stephen v2 on Vimeo. I had really always thought it would be so cool to do a poster set with great design for each of the planets. I actually started a design for the Cassini at Saturn mission, but have yet to complete it. Sure enough someone comes along and knocks the whole system out in one fantastic series. Beat me to it! The funny thing about doing the whole Solar System is that you will not likely have too many takers for Uranus or even Pluto. But the design on some of these makes it pretty tempting to grab just for the overall design. I can’t wait to email Ross when New Horizons gets to Pluto and it looks nothing like what is shown here. A gorgeous inclusion of the hypothetical ring some expect to find when we get there, but where are the 3 moons? I would be a fool to not include Saturn. The exclusion of the Galileans at Jupiter, no Charon on the Pluto poster and the absence of Titan here on the Saturn poster... I wonder if I sense a moon series coming? Put me down for a copy of Io. Gordan U compiled this image of Enceladus lit both by Sun and Saturnshine. The side lit by reflected light from Saturn is in infrared and in the original appeared in a green hue. I took some liberties and imaged it as I would imagine it really would appear to the eye in Saturn’s more orange/yellow hues. Worth noting tomorrow the images are due in from Cassini’s closest approach yet through its plumes. Hoping for some amazing material. Not at all meant as a “gotcha” at all… but I just love when I take the time to clean these up and people start using these my clean-ups over the ones officially released. Daily Galaxy posted my Comet Halley clean up and I knew I recognized it as my handy work. They most likely got it off Google image search. Nice example of science meets Hollywood. Another fine color composite by Jason Perry the original which can be found here. Also made a wallpaper from the excellent Tvashtar Caldera region image posted here a while back. This was rendered by Ricardo Nunes using images also compiled by Jason Perry. Jason Perry has been featured here a whole bunch lately as he has been uploading newly processed Galileo images nearly every week (not to mention the recent New Horizons set). Some of these images would make great wallpaper displays, but the only issue with some are missing data regions and the noise that is common with hires images from the Galileo mission. Wanderingspace has attempted to artistically replace and clean of few of these images and will be posting the results of these for the next few days. The region shown is the most famous of Io’s active volcanoes Prometheus. Normally we see this volcano at the edge of Io’s limb to view the plume clearly on profile, but here Galileo views this very active region from above during a flyby on orbit #27. The reddish haze surrounding the area is either the plume itself jettisoning materials or could also be deposits lying on the ground – perhaps Jason will comment and clarify. 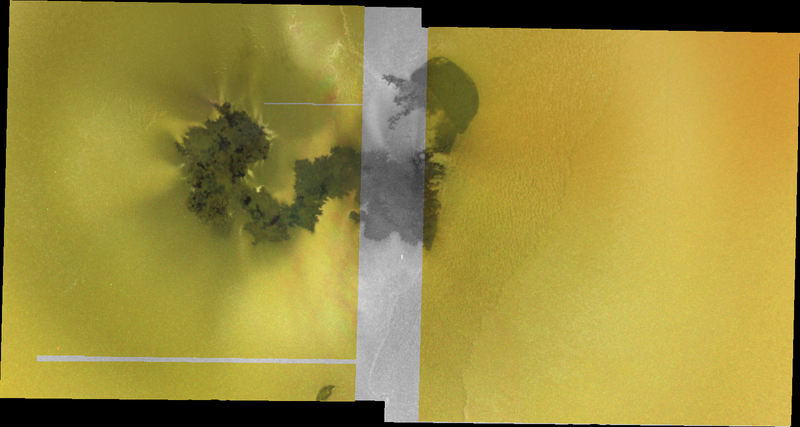 The above image is the Jason Perry original and the missing color information is apparent (only the green channel was provided from the mission). The noise at this scale is less apparent but much more visible on the hires version. It is important to note that the wallpaper version is an artistic attempt at cleaning and replacing the missing data and is meant for display viewing not science! IMAGE NOTE: As stated above – the missing color data was colorized in the region it was missing and some of the thin strips of missing color data was simply replaced with new image information. You can also see areas at the edges of the composition that were filled with duplicate image data to fill the wallpaper frame most notably at top right and bottom left. The remainder of the image is original except for the noise reduction provided by Photoshop. Jason Perry’s most excellent Io blog (who would have ever expected there would be an Io blog one day) is loaded with his finely reprocessed Io images from the historic Galileo mission. Some of the more dramatic images were only captured in monochrome (that is black and white to most), so I thought I might try and colorize one of these images just for shits and giggles. The image is that of Hi'iaka Patera and two nearby mountains (taken in 1999). The tallest peak is about 11 kilometers high. The dark features are usually thought to be calderas, however the dark regions here could be depressions that were later filled by dark lava flows. Galileo took the images at from about 26,000 kilometers. The colorized image is merely an artistic impression. You can see where missing data has been “filled” in with texture by comparing the two images and seeing where the composite left gaps. The color information is wholly interpretive and based upon colors that appear in many other Io images but are not at all matched up to the region specifically. The real image was processed by Jason Perry and the original image is located on his page of Galileo Io images from orbit 25. NOTE: Technically the image itself is interpretive in that it is not an RGB composite but instead a colorized black and white image based upon other color images from the same region. Usually you can almost tell from a glance when this is done, but this one looks spot on. The one Saturn image that we keep coming back to at wanderingspace seems to be the Ian Regan portrait of Saturn. The composition, angle and color captured in the shot somehow seem to be better than any other. While there are a few other full Saturn images now available from the Cassini mission, none seem to have captured the drama that this one does. The angle that the ring shadows fall on Saturn’s disc, the phase that Saturn happened to be in at the time and the color available as the shot was taken from a more northern position. However, trying to apply the image to larger scale resolutions was not possible as the resolution in the orignal would require that the rings be extended to fill the frame on the left, right, bottom and potentially the top as well (I was also curious to see if the image was just as impressive if it was not angled and cropped as it is in the original). Extending the rings in one direction is easy enough, but doing it on all sides is near impossible to try to do in any image editing software such as Photoshop. Instead, a one pixel wide swash of the rings was sampled and turned into vectors using Adobe Illustrator. This further allows Illustrator to stretch and curve the ring information captured without having to worry about resolution or pixel distortion. The row of rings was then applied to a brush pattern and applied and wrapped to a simple circle shape. Now the rings are in full circle and the proportions are adjusted. That full set of rings was then rendered in 3-D software and the correct angle as well as perspective was applied and matched with the original Ian Regan image underneath the render for reference. After that, all that is left to do is merge the Regan image to the rings (and maintain as much of the original image as possible) and artificially add the disc shadow that would fall upon the rings behind the planet iteself. I am honored to be the host of The Carnival of Space’s 22nd edition with a focus on the art of space. Wanderingspace considers images of our Solar neighborhood to be art in their own right, so here the line between art and science is thinly drawn to begin with. Enjoy the links! Recently artist Bettina Forget had one of her creations featured on the back cover of a recent Planetary Society periodical. She posts at her Inside the Artist’s Studio blog and recently mused on sketching at the eyepiece of a telescope and its benefits. Be sure to also take a look at her Moon Series, which is where the previously mentioned Planetary Society featured painting of Io and Europa can also be viewed. Another fine arts bit of space creativity can be found in the recent work of artist Robert Whitman. Pixel Pusher has an introduction to his show “Turning” which features glowing, spinning sculptures of such moons as Europa and Ganymede while another installment involves a projection of Io. The show is currently on exhibit at the Pace Wildenstein Gallery in New York City. So hop on the subway, it closes on September 29! If you don’t just want to look at space art but actually create it, Artsnova Digital Art and Space has a few words on a new NASA Space Art Contest whose theme is “Life and Work on The Moon”. Still feeling creative? The Wired Science Blog is hosting a NASA Slogan Contest where we all have an opportunity to come up with our own slogan and submit it. This contest is only open to entries for about another 24 hours after this goes live, so hurry over! In the strange category, The Podcast Troubadour offers up two Carnival of Space Themes for your listening pleasure. One is more theatrical and breaks into what can only be described space carnival music while the other will shake your descent stage thrusters. Yes... theme music for The Carnival of Space. The internet is a place where anything can happen and usually does. If you are unfamiliar with the work of IMAX in a Basement you need to take a look at what exactly is coming out of that basement. The film “Outside In” is entirely made of Cassini still images and is somehow made into what feels like a 3-dimensional voyage to Saturn without the use of any 3-d modeling software. Check out his new offering of 100 Megapixels of Saturn Ring Magnificence with both a hires still and a sneak-peek video segment. Bridging the gap between art and pure space science, I feel the need to link to Don Mitchell’s Mental Landscapes site for his Soviet Venus Images collection. This is not a blog... i know... but if you scroll about half-way down the page you will see his re-worked Soviet Venera images of the surface of Venus which is just about the most incredible feat i have seen by any freelance imager. Maybe you are familiar with his work already, but if not... every fan of space exploration needs to know that these images now exist thanks to Don. Riding with Robots reflects on that recent Hubble image of Ceres in, “The Clear Power of a Fuzzy Image” which according to the author “embodies his fascination with space exploration”. While we are in a reflecting mood Cumbrian Sky compares the 1981 experience of images of Iapetus coming from Voyager to the 2007 experience of images of Iapetus coming directly to our computer screens from Cassini. Space exploration has certainly changed in 25 years. If you want to see more about the recent Iapetus flyby be sure to check out Emily Lakdawalla’s post on the Voyager Mountains and her most excellent link at the end of the article to the full set of images and metadata from the event. For some off topic posts, A Babe in the Universe offers a new video Images of a New Space Age. Sorting Out Science considers the recent meteorite impact in Peru. Unenumerated has some real options analysis for space projects and takes a fresh look at risk evaluation for deep space missions. Robot Guy posts a whole episode of The Universe’s Mars Episode. Astroblogger captures the ISS whiz past Jupiter. Hobbyspace is telling us about how Google Moon is getting sharper as well as a new 3-D Hubble IMAX movie in the works. And Mr. Gerhards is hoping to record the goings on in going to see Shuttle launches before its too late. Finally, some posts on two books from completely opposite ends of the spectrum. Lunar Photo of the Day takes a peek into the book-by-committee publication, “The Scientific Context for Exploration of the Moon” which is apparently the kind of book that may hold some sway in terms of Lunar decision making over at NASA. On the other hand, Music of the Spheres blogs on “Cosmos for Beginners” which, unlike the previous title, could be a nice purchase for children of all ages between 12 and 90. Well, thats all for now. Make sure you bookmark some of these excellent blogs and maybe even subscribe to their RSS feeds. Remember, its the internet… all the planetary love you can ever ask for and its all for free! This is a bit old taken from February 2007’s New Horizons encounter at Jupiter. 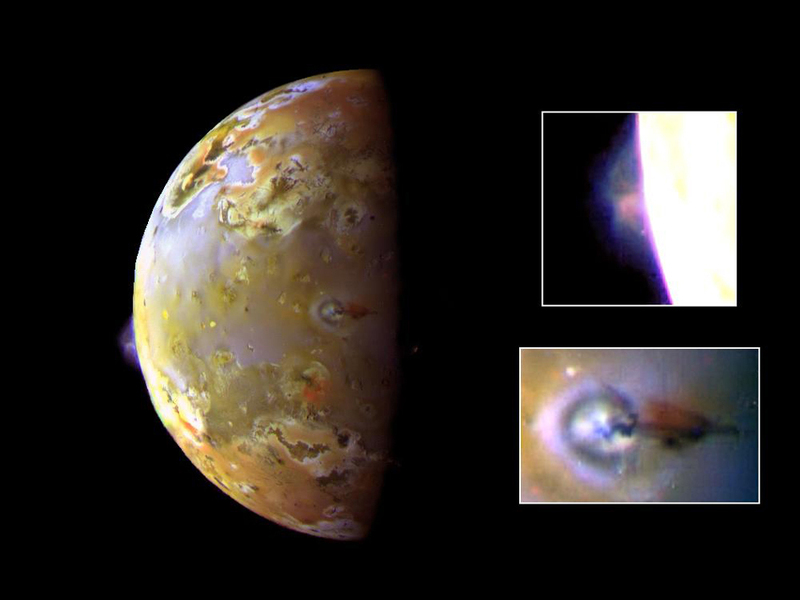 A very noisy image was released of Io on the dark side of Jupiter that illustrated the glowing lights of lava flows and auroral displays in Io’s tenuous atmosphere interacting with Jupiter’s magnetosphere. Noise always bothers me and there has been a desire to somehow clean up the presentation of this fantastic image. The process was simply to blur the image, layer highlight information a few times with varying degrees of sharpness or blur and to simply hand remove what would seem to be simply noise artifacts. The problem is that some of this information wasn’t just noise, but is actually auroral glow (especially at the disk edge). So after some of the noise was removed it was softened and re-introduced selectively around active areas where the assumption is that the glow near these spots is more intense. The final step was to simply reduce the file size so that it became sharper. This presentation is purely artistic although it does come from real image data… I just wouldn’t use it to support any scientific papers. The items marked simply as “volcano” were newly discovered by New Horizons. What Might the Dust Storm Look Like on Mars? The above image was generated by “hortonheardawho” for unmannedspaceflight.com and represents some of the earlier days of the Martian dust storm currently enveloping the planet. This is Mars as seen from the Opportunity Rover who seems to be suffering under the storm worse than Spirit on the opposite side of the globe. While these skies are somewhat dark take a look at what it might have looked like around July 15 (or Martian day #1235 of the mission since arriving). Using an image developed by Jim Bell to show the relative brightness of the dust storm at Opportnity’s position, the above image was artistically re-interpreted to show what that same scene might have looked like a few weeks later. The rovers have since been shut-down almost completely to try and conserve power and word has it that at present it is even darker than suggested here. The loss of light reaching the surface of Mars at Opportunity’s position is currently more than 99% and should these storms go on for too long the rovers will run out of energy with no light reaching their solar panels and that would finally spell the end of these long-running missions. Even though all operations that use any kind of power have been shut-down, the rovers do need to constantly use enough power to stay warm. As of this time, there is so little energy being replenished that just running the heaters is using up more energy than can be regenerated from the solar collectors. While the situation does seem dire, most specialists expect the rovers to make it through this situation and expect to carry on after the storm dissipates. Coincidentally, Opportunity was just about to enter the Victoria crater and thankfully it had not as that would have surely spelled doom for that mission. The solar energy collectors would not only have had to deal with the low-light situation, but would have suffered under crater wall shadows as well.